Who was the impoverished French baroness who once lived in Mobile? 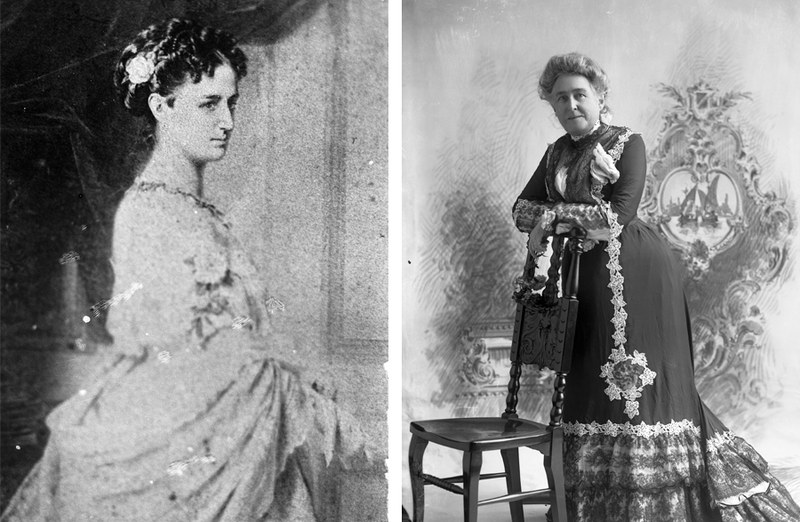 Emily Blount de Riviere (as pictured circa 1870 and 1900) led an elegant and — as some might posit — a scandalous life. Photos courtesy of the Erik Overbey Collection, The Doy Leale McCall Rare Book and Manuscript Library, University of South Alabama. There was a baroness here, but she wasn’t French. She was actually born on a plantation called “Woodlands” near Claiborne, Alabama, in 1841. Emily Blount was the daughter of attorney Frederick Blount who had begun his practice in the booming area of Claiborne in western Monroe County in the 1830s. The Blount home featured a musicians’ gallery in the entrance hall and was the setting for many a party in the 1840s. The fortunes of Claiborne began to diminish, and by 1852 the Blount family had moved to Mobile and occupied a house on the southwest corner of Springhill Avenue and Lafayette Street. No photographs survive of that home, but it was impressive enough to have hosted Henry Clay a decade earlier. In 1858, Mobile had a French visitor named Henri de Riviere, who was described as “a tall military-looking man with a strong well-bronzed face.” America in the 1850s was enthralled with all things French, whether it was a dress or parlor furniture. Here was a handsome Frenchman, rumored to be a baron and a veteran of the Crimean War. Parlors in Mobile were thrown open to the visitor, who was surrounded by admirers — usually female. Their male counterparts were not as pleased by his presence. At one of their watering holes, Captain Harry Maury — a local wit — loudly declared Riviere “Count, no account and baron of intellect,” which had the room roaring. The subject of his joke was not amused and challenged Maury to a duel involving a pair of Colt revolvers at 12 paces. Maury shot first, and the wounded Riviere was brought back to town down Springhill Avenue, where one of the Blounts stopped the group and invited him in to recuperate. Just who extended the invitation is not clear. What is known is that when Frederick Blount returned from a legal matter upstate, he found his house empty of his wife, daughter and Riviere. He chased the trio to Cuba and then New York while all of Mobile wondered just who Riviere was after — teenaged Emily or her attractive mother? The triangular elopement made its way into newspapers around the country. The chase ended in a New Jersey hotel, and Mrs. Blount explained she went along as her daughter’s chaperone. Riviere did not return to Mobile, but there was an arrangement for him to marry Emily once she was of age. Riviere returned to France, where he eventually came into his inheritance and baroncy. He wrote the Blounts and sent funds to cover their travel expenses so they could join him. The Civil War had erupted, causing the family to board a blockade runner to Cuba to get Emily to France for her wedding. As the Baroness de Riviere, Emily found herself living in a grand house in Paris while maintaining a villa on Capri. Her gowns came from the house of Worth, and her husband was honored for having chartered a ship from South America to provide exotic animals for the Paris Zoo. Eventually Emily’s funds ran low, and bit by bit she sold off her jewelry, artwork and other treasures she had brought from France. In her final years, she survived by the kindness of friends who invited her for all her meals, and she died in 1917 at the age of 76. Ironically, Emily never referred to herself as a baroness. She preferred the title of madame. Although Madame Blount’s home in Mobile was demolished long ago, “Woodlands” survives. It will be open to the public the weekend of October 12th. For more information, visit www.monroecountymuseum.org.